Who are the majority of the Victims? Infidels!!!! BCF : This afternoon, Corbynistas and other activists will protest outside News UK in London. 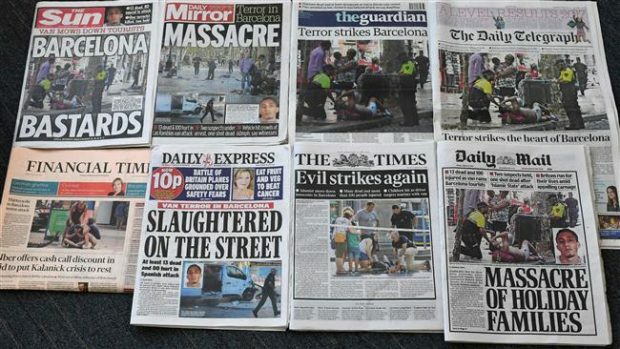 They think the newspapers produced in that building, primarily the Sun and The Times, are ‘Islamophobic’ and therefore bear some responsibility for the barbaric racist slaughter in Christchurch last week. This is a new low for the censorious PC left. It is not five years since nine journalists and cartoonists (and three non-journalists) were massacred in France for the crime of being ‘Islamophobic’, shot to death at their desks simply because they mocked Muhammad and were stinging critics of radical Islam. To gather outside the offices of journalists and brand them ‘Islam-haters’ so soon after journalists were murdered for being ‘Islam-haters’ strikes me as quite repulsive. Within the broader context of extremism in Canada, the number of right-wing extremists who promote or are willing to engage in politically-motivated violence is extremely small,” read an emailed contribution to the report that appears to have been written by the Canadian Security Intelligence Service.